May is Skin Cancer Awareness Month, and the American Academy of Dermatology (AAD) is recognizing Skin Cancer Heroes — patients and survivors, the friends and loved ones who have helped and supported them, and the board-certified dermatologists who have detected and treated their skin cancer. The AAD also encourages everyone to be their own Skin Cancer Hero by taking steps to prevent skin cancer and detect it early, when it’s most treatable. Do you know that some sunscreens can prevent sunburn, reduce your risk of getting skin cancer, and help prevent early signs of skin aging? 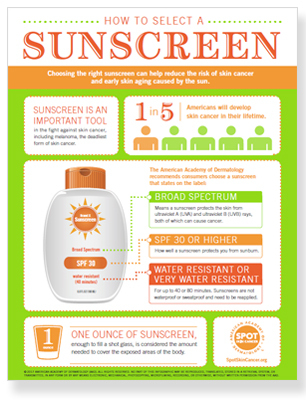 This infographic tells you how to choose a sunscreen that does all three. Broad spectrum: The words "broad spectrum” means that the sunscreen can protect your skin from both types of harmful UV rays — the UVA rays and the UVB rays. SPF 30 or higher: The American Academy of Dermatology recommends that you select a sunscreen with an SPF rating of 30 or higher. Experts say sunscreens with an SPF higher than 50 aren't worth buying.SPF 30 blocks nearly 97% of UVB radiation, SPF 50 blocks about 98%, and SPF 100 blocks about 99%. Having the higher SPF does not provide enough additional protection and it can give a false sense of security so people tend to not reapply as often as they need to. Water resistant: Dermatologists also recommend that you look for the words "water resistant.” This tells you that the sunscreen will stay on wet or sweaty skin for a while before you need to reapply. Water resistance lasts either 40 or 80 minutes. Not all sunscreens offer water resistance. How you apply your sunscreen also affects how well it protects you. You can find out how to get the most protection from your sunscreen by watching the Academy’s video “How to apply sunscreen”.